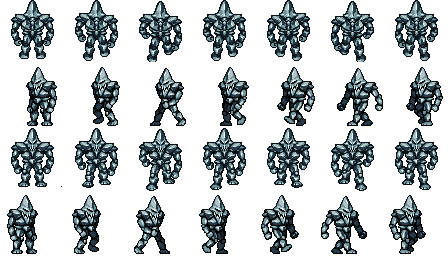 A golem made in LPC style by Redshrike. Thanks Bertram. Yes, it's intended for use in the game I've been working through. Right now game progress is still invisible but the assets still make for pretty things to see and can still be used in other people's projects. Using the walk animation as a resource for a GameMaker exam. Applogies for the double post. I don't see a way to delete this myself, so if a mod could get rid of this that'd be swell. Hello Languard, I'm happy to hear this was useful to you. This is one of many more animations to come. Stay tuned for further developments. 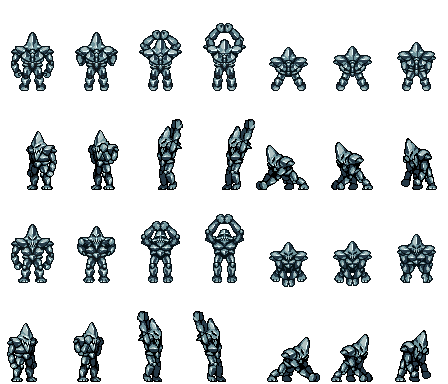 @RamakantB I have questions about the lisences for Commercial use, I too want to make a game with this sprite however I want to make sure that the only thing I have to do is credit as stated above in order to do so. Use the artwork to your hearts content, list me as contributor, list redshrike as artist. No cost to use, no strings attached, no hidden catches. William may I list your name as just William Thompson or William J. Thompson I just don't want to put the J at the end. So it looks more professional. Ok, I will list it as "William J Thompson" then. As for how to list it, I have one question. Do I have to list each asset individually; or can I list you as a contributor to the artists you commisioned in the end game credits without listing each individual asset? Because keeping track of everything would be a pain. Just my name at the end listed as contributor is fine, I would hate to think I'm generating that level of extra work for you to tag me on every individual asset used.